I’m certainly not the first person to have discovered Boris Anrep and I most certainly won’t be the last. Many of us discover him in exactly the same way – by looking down at our feet. Nothing strange about that, you may think, except you’re looking down at your feet in a place where you’re expected to look up at all the fantastic art on the walls. 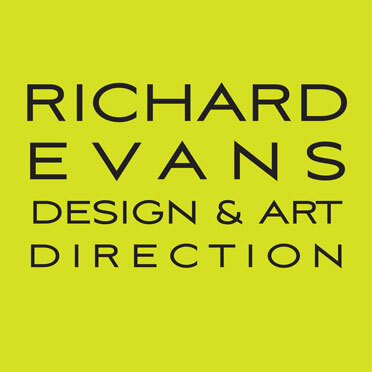 I’m talking about the National Gallery in Trafalgar Square, London. 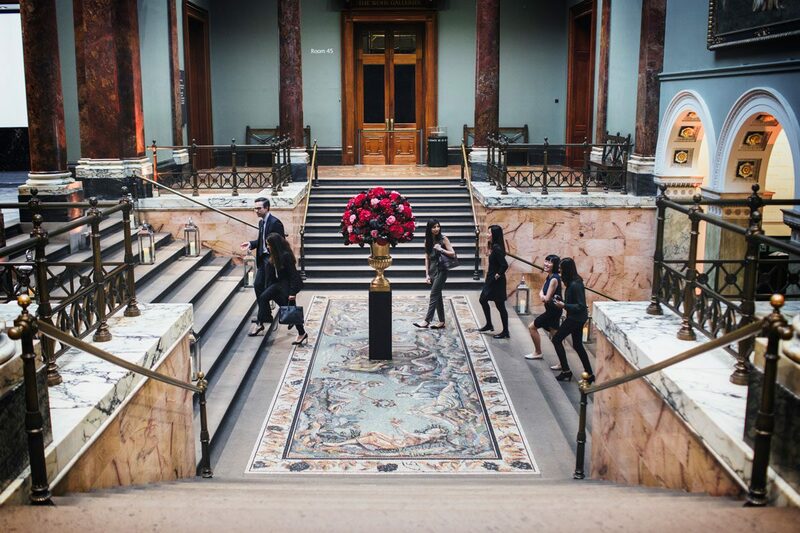 When you enter the Gallery via the Portico entrance, take a look at the floor and I guarantee you’ll be amazed and stunned at what you’ll see before you – the most beautiful and intriguing marble mosaic, The Awakening of the Muses, and all the work of Russian emigré Boris Anrep (1885-1969). 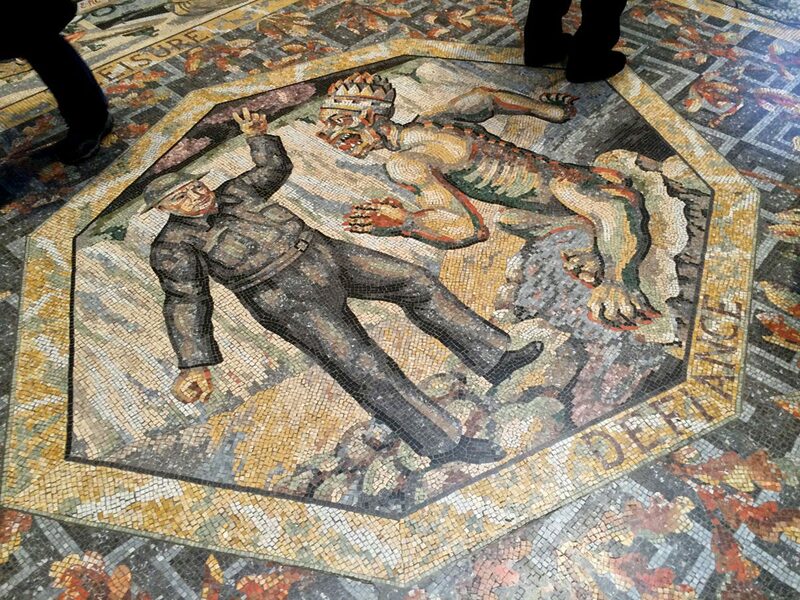 Anrep was commissioned by the National Gallery between 1928 and 1933 to produce the marble mosaics in the Main Hall to illustrate The Labours of Life and The Pleasure of Life utilising images from everyday life and featuring some familiar faces of the day. So you see people such as Bertrand Russell included in a picture of Lucidity, and astronomer Sir Fred Hoyle climbing a church spire in Pursuit. Anrep was an associate of the Bloomsbury Group of writers and artists and in keeping with their modernist way of thinking, his models and characters are figures from everyday life rather than god-like immortals. Anrep was later commissioned to add a third mosaic in 1952 entitled The Modern Virtues which included (above) Sir Winston Churchill standing up to some devilish creature in Defiance, Margot Fonteyn with Edward Sackville-West on harpsichord in Delectation, T.S.Eliot and Albert Einstein in Leisure and Greta Garbo as Melpomene, Muse of Tragedy. 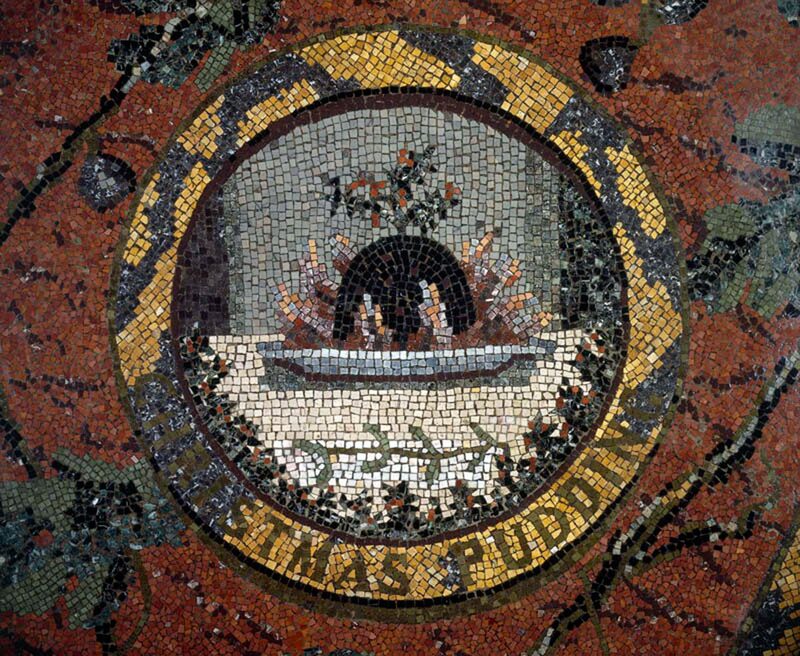 And if you ascend the stairs and turn right, just before the door to Room 45 (Van Gogh’s Sunflowers, Delacroix, Paul Cézanne, Frederic, Lord Leighton et al) gaze down at your shoes and marvel at this magnificent Christmas pud. A merry Christmas to you and a very happy New Year. ← It’s a boy, Mr Daltrey, it’s a boy!